The manual transmission in the new Tucson deserves a shot. If you drive stick, you'll have to search for one on lots, though-Hyundai expects only 5 percent of all Tucsons will be fitted with it. The 2010 Hyundai Tucson doesn't quite take the title of best small crossover, but it handily grabs "most improved" honors. 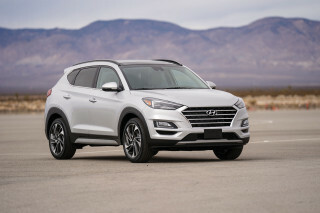 TheCarConnection.com's editors have driven the new 2010 Hyundai Tucson to bring you this firsthand road test. Editors have compared the new Tucson with other compact crossovers and have compiled a companion full review of quotes from other sources in a comprehensive look at the new Tucson. 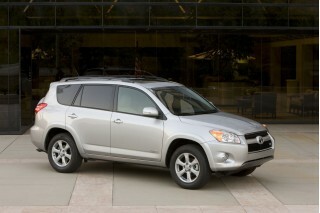 High Gear Media accepted travel expenses to attend the first drive of the 2010 Hyundai Tucson. It's been a banner year for Hyundai. The Korean automaker has introduced its new Genesis sedan in the Genesis Coupe and has shown off a new Sonata sedan that's in the works for the 2011 model year. On top of all those new products, it also has a brand-new 2010 Hyundai Tucson ready to go on sale-and this time, it's aimed directly at the likes of the Honda CR-V and Ford Escape. With a base price of less than $20,000, the new Tucson has gone on sale with a choice of front- or all-wheel drive, manual or automatic transmission, as well as a sole four-cylinder engine powering both the GLS and Limited versions. Looks aren't deceiving; the 2010 Hyundai Tucson smartly steps to the front of the compact-crossover class with a curved, crested, upscale design. The sheetmetal is nearly the reverse of the past Tucson's bland, upright style sheet. It no longer bears much visual resemblance to anything you might see in Tucson, Ariz., for good reason: The look comes from its European design studios, teamed with those in Korea and the United States, with perhaps more than a casual nod to the Nissan Rogue and the Euro-market Ford Kuga. Some versions have more chrome trim work around the grille and sides, while all editions have black trim that cuts the visual height of the doors on the side view. From its nose to its tail, the Tucson appears compact and edgy, while the rear end has visual mass that's cut somewhat by angular tail lamps. Inside, the 2010 Tucson steps into the thick of global interior design with a big LCD screen, flanked by chromed vents, and dashes of metallic-painted plastic breaking up plenty of tightly grained, hard black plastic. It's not quite in the same class as the Rogue or CR-V, but the Tucson's interior is at least as nicely executed as that in the Escape and on par with the Toyota RAV4. The 2010 Tucson moves in a more economical, fuel-efficient direction for power. With either front- or all-wheel drive, all 2010 Tucsons come with a 2.4-liter four-cylinder engine with 176 hp and 168 pound-feet of torque. Next year, Hyundai will offer a Tucson Blue model with a 2.0-liter four and slightly better fuel economy: a turbocharged four-cylinder. The available four-cylinder propels the Tucson quicker than, say, the Honda CR-V to 60 mph, but a rough reading of speed puts its 0-60 mph time in the 10-second range. It feels more sluggish from a standstill than at highway speeds, and the engine is at least smooth and relatively vibration-free. Either a six-speed automatic or six-speed manual gearbox can be fitted; the manual transmission has a long throw but smooth action, while the six-speed automatic has a sport-shift mode but no paddles at fingertip reach, so it's a rare occasion you'll actually engage the sport mode. The automatic will account for almost 95 percent of all Tucson sales, Hyundai says, and it's fine for most urban duties, with reasonably quick responses to throttle changes. TheCarConnection.com's editors find the Tucson's ride quality pleasant enough, especially in the backseat, but the feel of its engine-speed-sensitive electric power steering leaves editors unimpressed despite its tight 34.7-foot turning circle. Braking pedal feel is lacking, too, though the Tucson comes standard with anti-lock control. In general, the Tucson's road manners are significantly improved over the prior edition. 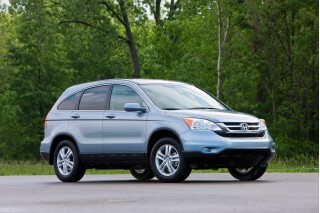 Fuel economy is 23/31 mpg for front-drive versions, and 21/28 mpg for all-wheel-drive Tucsons-a good measure better than in the Honda CR-V or Escape. At 173.2 inches long, 71.7 inches wide, and 66.3 inches tall, the 2010 Hyundai Tucson has a longer wheelbase and is wider than the Honda CR-V, Ford Escape, and Subaru Forester. And while it offers more interior room than the Nissan Rogue and Ford Escape, the Tucson has slightly less interior and cargo room than the Honda CR-V, and it's significantly smaller inside than the Toyota RAV4-though Hyundai points out it offers more interior room than a BMW X3 or an Acura RDX. Editors at TheCarConnection.com find the Tucson's front seat space very good with plenty of legroom, but the leather seats fitted to some test cars have a sloping bottom cushion that grows uncomfortable quickly. In the back, plenty of room for adults is available, and though the seat cushions could be longer, it's clear the Tucson's cloth seats are better choices than the leather-clad ones, at least for now. Cargo room is large enough for medium-size pets, a significant amount of luggage, or enough groceries for a family of four for a week, though the Toyota RAV4 offers enough room for a third-row seat. Interior storage is well planned inside the Tucson, with cubbies and bottle holders in the console and door panels, and a deep glove box up front. The fit and finish of our prototype test vehicles was generally good-a vast improvement over the previous Tucson-though hard plastic is the rule of the cabin trim, not the exception. In terms of safety, the 2010 Tucson has all the expected standard equipment. That list includes dual front side and curtain airbags; anti-lock brakes; and traction and stability control. Hyundai officials anticipate the Tucson will score very well in federal crash tests, but no official results are available as of yet--though the IIHS rates it a "Top Safety Pick." Hill descent control is also standard, along with brake assist, tire pressure monitors, and active headrests. Visibility is good, save for some dark corners at the rear quarters of the Tucson, where its dashing roofline meets the tailgate. Hyundai is sparing few features from the Tucson's standard-equipment list. It's extremely well-fitted, particularly for its price class. Each Tucson comes with power windows, locks, and mirrors; remote keyless entry; cloth seats; air conditioning; and an AM/FM/XM/CD player with USB connectivity. Options include Bluetooth; steering wheel audio controls; heated front seats; leather seating; a power driver's seat; automatic headlights; 17-inch wheels; and dual-zone automatic climate control. The Tucson can be ordered with Hyundai's first panoramic sunroof; telescoping steering, an engine cover, and premium audio are available, along with a touchscreen navigation system fitted in tandem with a rearview camera and Bluetooth stereo audio. Hyundai also continues to offer a 5-year/60,000-mile bumper-to-bumper warranty, which extends to 10 years/100,000 miles for some powertrain parts. Fully optioned, the 2010 Hyundai Tucson checks in at a believe-it-or-not $29,490, so take care with the order sheet. The 2010 Hyundai Tucson breaks new styling ground among compact crossovers. Looks aren't deceiving: The 2010 Hyundai Tucson smartly steps to the front of the compact-crossover class with a curved, crested, upscale design. TheCarConnection.com's editors scan their review, as well as reviews from other sources, and find most writers are pleased by the big changes in the Tucson's style. From its nose to its tail, the Tucson appears compact and edgy, while the rear end has visual mass that's cut somewhat by angular tail lamps. While it's no "Audi-style standout," Automobile reports, "it falls somewhere in the range between inoffensive and blandly attractive." The sheetmetal is nearly the inverse of the past Tucson's bland, upright silhouette. 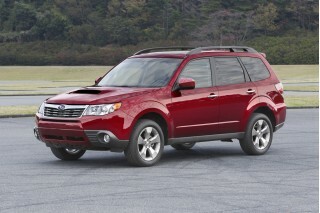 It's "a big, flamboyant step away from the humble look of the outgoing model," Edmunds comments. The Tucson bears perhaps more than a casual nod to the Nissan Rogue and Murano, Motor Trend says, "which is about as far as you can get from the first-gen." It's "much friskier than anything Toyota has tried in this segment," Car and Driver observes. Autoblog likes the view to the Tucson's front end, where you can see "the thrust of the design's flow and how winds its way around the car." Some versions have more chrome trim work around the grille and sides, while all versions have black trim that cuts the visual height of the doors on the side view. Autoblog thinks that's the car's worst design element: "the black plastic chunks below the doors look like the afterthoughts they are." Cars.com remarks, "If the last Tucson looked affable, this one seems sophisticated," but many reviewers question its longevity. "Will it wear well or soon seem outdated?" USA Today asks. "For the moment, it looks good." Inside, the 2010 Tucson steps into the thick of global interior design with a big LCD screen, flanked by chromed vents and dashes of metallic-painted plastic breaking up plenty of tightly grained, hard black plastic. USA Today says the presentation of dials and gauges has a "stunning simplicity that looks and feels inviting," while Car and Driver admires the "expensive-feeling buttons on the nice dash" and the "sporty-looking and functional" gauges. 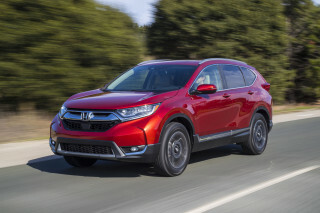 While TheCarConnection.com's editors feel the Tucson's cabin is not quite in the same class as the Rogue or CR-V, Edmunds believes the interior "compares favorably with Honda's CR-V and puts the Toyota RAV4 to shame." Automobile leans more in our direction, calling the interior "pleasant-looking" but noting "lots of hard plastic" in the cabin. Autoblog voices concern, however, that the "refreshing" design is "bordering into Honda's weird territory of organic shapes and spread out buttons." The 2010 Hyundai Tucson raises its performance game, but it needs more power and more steering feel. The 2010 Tucson moves in a more economical, fuel-efficient direction for power, while it also gets better at negotiating curves. With either front- or all-wheel drive, all 2010 Tucsons come with a 2.4-liter four-cylinder engine with 176 hp and 168 pound-feet of torque. The available four-cylinder propels the Tucson quicker than, say, the Honda CR-V to 60 mph, but a rough reading of speed puts its 0-60 mph time in the 10-second range. USA Today reports the four-cylinder "felt lively, smooth and capable," and calls it "more pleasant to drive than rivals' four-bangers." It feels more sluggish from a standstill than at highway speeds-Cars.com contends it's a "capable acceleration around town, but uphill stretches left me wanting for last year's V-6" and its torque. The engine is smooth and relatively vibration-free, "never thrashy or intrusive in nature," Edmunds declares. Next year, Hyundai will offer a Tucson Blue model with a 2.0-liter four and slightly better fuel economy, "the fuel-economy and price leader," Motor Trend says. Either a six-speed automatic or six-speed manual gearbox can be fitted; the manual transmission has a long throw but smooth action. USA Today says it's "an easy joy" with a "light-touch clutch"-but Cars.com finds it has "medium throws and poorly defined gates." The automatic will account for almost 95 percent of all Tucson sales, Hyundai predicts, and it's fine for most urban duties, with reasonably quick responses to throttle changes. The six-speed automatic has a sport-shift mode but no paddles at fingertip reach, so it's a rare occasion you'll actually engage the sport mode. It "sometimes had to work a little on grades," Motor Trend notes, "but putting it in manual mode on twisty mountain roads eliminated any hunting." USA Today likes that the automatic lacks "goofy steering-column shift paddles that are...laughably silly in many modern family cars." Fuel economy is 23/31 mpg for front-drive versions and 21/28 mpg for all-wheel-drive Tucsons-a good measure better than in the Honda CR-V or Escape. Cars.com says the numbers are "impressive, pretty evenly matching the uncommonly efficient four-cylinder Chevy Equinox," and Automobile agrees. As Autoblog points out, the Tucson has a "little green ‘Eco Indicator' light that shows up when you're driving in a fuel-friendly manner." In a "suddenly mileage conscious America," they add, "this is a big selling point." In general, the Tucson's road manners are significantly improved over the prior edition. TheCarConnection's editors find the Tucson's ride quality pleasant enough, especially in the backseat. Other reviewers discover the same. Motor Trend describes the Tucson's "fully independent suspension" as part of the package that generates what Cars.com calls "acceptable" ride quality. "The suspension preserves decent comfort," they feel, "but bumps make their way up to occupants easily enough." Yet more reviewers believe the Tucson has good ride control-Edmunds cites its "good compromise between ride comfort and body-motion control," while Automobile describes a "pleasantly firm suspension that provides nearly flat cornering attitudes," though Motor Trend does note "the suspension doesn't absorb enough of the impact of hitting a pothole." Even with the optional all-wheel drive, the Tucson's handling is improved; the system can be locked for equal torque distribution to front and rear wheels, and Edmunds "couldn't detect any substantial difference in control feel between the front- and all-wheel-drive models." However, Car and Driver reports the AWD Tucson "has a stiffer suspension that clops down harder on the rough stuff." The Tucson's electric power steering attracts the most negative comments. The feel of its engine-speed-sensitive electric power steering leaves TheCarConnection.com's editors unimpressed despite its tight 34.7-foot turning circle. USA Today calls it "well-tuned, with good on-center feel on straight roads and responsive turning and road feel in the snaky stuff," and Cars.com deems it "natural" and "well-weighted," but most other reviews dislike the feel. "At 60 mph, its steering suddenly becomes monstrously heavy," Car and Driver points out, also commenting it "reeks of robotic artificiality." Motor Trend calls it "a bit artificial," and Edmunds also cites the "slightly artificial feel." Braking pedal feel is lacking, too, though the Tucson comes standard with anti-lock control. "The pedal's linear response is on par with others in this class," Cars.com observes. The 2010 Hyundai Tucson makes tremendous progress on interior space and quality, though it's still a smaller offering in its class. It's not as spacious as most of its rivals, but the less expensive 2010 Hyundai Tucson scores with reviewers from TheCarConnection.com and around the Web for its adult-sized seats and vastly better fit and finish. At 173.2 inches long, 71.7 inches wide, and 66.3 inches tall, the 2010 Hyundai Tucson has a longer wheelbase and is wider than the Honda CR-V, Ford Escape, and Subaru Forester. And while it offers more interior room than the Nissan Rogue and Ford Escape, the Tucson has slightly less interior and cargo room than the Honda CR-V, and is significantly smaller inside than the Toyota RAV4-though Hyundai points out it offers more interior room than a BMW X3 or an Acura RDX. In all, there are 101.9 cubic feet of passenger space; 25.7 cubic feet lie behind the rear seat, and when it's folded down, the Tucson offers 55.8 cubic feet of cargo room, USA Today notes. 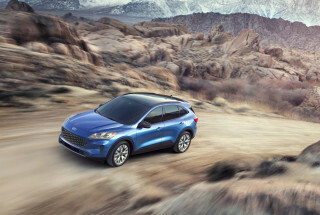 Cars.com says that makes the 2010 Tucson "small"-rightfully so, since they also note the Tucson is shorter than a Ford Escape and "at least 6 inches shorter than a CR-V or Toyota RAV4." Still, the interior space is "larger than that of a BMW X3," Edmunds points out, while Motor Trend says "the cabin is roomier and is now more in line with the space provided by its competition." Editors at TheCarConnection.com find the Tucson's front seat space very good with plenty of legroom, but the leather seats fitted to some test cars have a sloping bottom cushion that grows uncomfortable quickly. Automobile calls the front seats "comfortable," though Cars.com feels "drivers around 6 feet tall may find the driver's seat cramped," due to their impression of limited seat travel. In the back, plenty of room for adults is available-"you'd think you were in a midsize machine," USA Today declares, "especially back-benchers." It's clear the Tucson's cloth seats are better choices than the leather-clad ones, since the cloth seats have longer bottom cushions. USA Today reports the backseat "doesn't slide fore-aft, as rivals' do," and Cars.com notes "some adjustability would be welcome," though it adds the "rear seats offer decent headroom and adequate legroom." Car and Driver observes the "rear bench sits high off the floor and offers enough legroom and knee clearance to allow a six-footer to sit behind himself." Autoblog likes the rear seats best: "The rear seats might even be better than those in the front, reminding us of the Infiniti FX's rear quarters - a compliment, to be sure." Cargo room is large enough for medium-size pets, a significant amount of luggage, or enough groceries for a family of four for a week, though the Toyota RAV4 offers enough volume for a third-row seat. The cargo space "ranks near the bottom of the class," Cars.com points out, while USA Today observes it's "some 40% shy of main rivals'." Interior storage is well planned inside the Tucson, with cubbies and bottle holders in the console and door panels, as well as a deep glove box up front. In TheCarConnection.com's experience, the fit and finish of prototype Tucson test vehicles was generally good-a vast improvement over the previous Tucson-though hard plastic is the rule of the cabin trim, not the exception. It "seemed more refined," USA Today observes, while Cars.com takes note of the "consistent, low-gloss appearance for most of the plastics within immediate view." Car and Driver says "the interior is even better" than the competition and feels "Hyundai is becoming the one to watch on interior quality at this price level." However, Autoblog sees "plenty of ticky tack plastic covering wide expanses." The 2010 Tucson seems reasonably quiet to most reviewers, with "some road noise," Motor Trend observes. But "when cruising, the Tucson is surprisingly quiet," Automobile asserts, and in part, that's the result of a "tight, vibration and body-movement free vehicle," Autoblog explains. 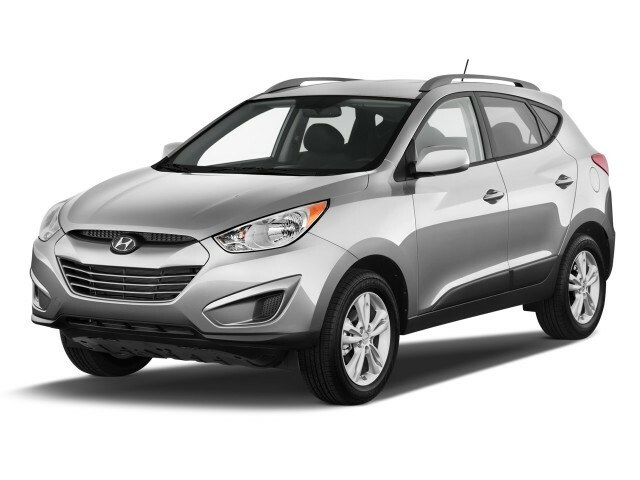 The 2010 Hyundai Tucson earns great crash-test scores, and offers some innovative safety equipment. Hyundai officials anticipate the 2010 Tucson will score very well in federal crash tests, but no official results are available as of yet. The insurance industry-funded Insurance Institute for Highway Safety (IIHS) gives the Tucson its top rating. In terms of safety, the 2010 Tucson has all the expected standard equipment. That list includes dual front side and curtain airbags; anti-lock brakes; and traction and stability control. The stability control has "a rollover sensor that keeps the curtain airbags inflated when you turn turtle," Edmunds explains. Hill descent control is also standard-"just like the big SUV players," Edmunds says-along with Brake Assist, tire pressure monitors, and active headrests. Visibility is good, save for some dark corners at the rear quarters of the Tucson, where its dashing roofline meets the tailgate. "Forward visibility is great," Autoblog proclaims, and "turning right isn't an issue either." But "rear visibility is compromised by the way the sheet metal kicks up beginning at the back edge of the rear door," USA Today notes. 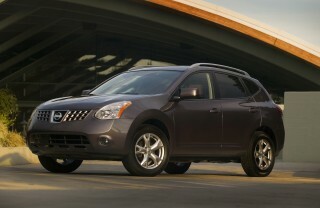 It's a syndrome that's "depressingly common among crossovers," Automobile says. The 2010 Hyundai Tucson amps its upscale intentions with smart audio, power, and luxury features. Hyundai is sparing few features from the 2010 Tucson's standard-equipment list. It's extremely well-fitted, particularly for its price class. 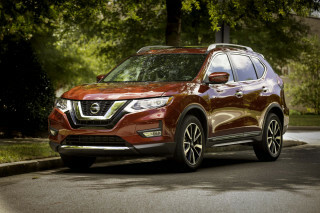 That class includes "fine choices" like the Nissan Rogue, the Honda CR-V, the Mitsubishi Outlander, and the Toyota RAV4, Car and Driver explains. "With GLS and Limited levels, two transmissions and few options, ordering a new Tucson will be a simple process," Edmunds promises. Each 2010 Hyundai Tucson comes with power windows, locks, and mirrors; remote keyless entry; cloth seats; air conditioning; and an AM/FM/XM/CD player with USB connectivity-"a nice inclusion" at this price, Cars.com says. Options include Bluetooth; steering wheel audio controls; heated front seats; leather seating; a power driver's seat; automatic headlights; 17-inch wheels; and dual-zone automatic climate control. The leather trim "feels rich enough for a pricier car," Cars.com says. The Tucson can be ordered with Hyundai's first panoramic sunroof; telescoping steering, an engine cover, and premium audio are available, along with a touchscreen navigation system fitted in tandem with a rearview camera and Bluetooth stereo audio. That navigation system suffers with a smaller screen: "At 6.5-inches big, the nav screen is only one and half inches larger than modern smartphones," Autoblog reports, though they add the screen works exceptionally well. Cars.com feels it's "fairly easy to use, with plenty of street labels and excellent graphics." Hyundai also continues to offer a 5-year/60,000-mile bumper-to-bumper warranty, which extends to 10 years/100,000 miles for some powertrain parts. Fully optioned, the 2010 Hyundai Tucson checks in at a believe-it-or-not $29,490, so take care with the order sheet. 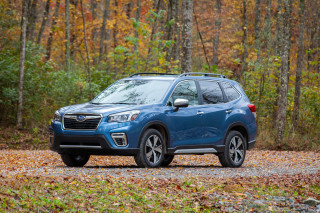 "Load it up with navigation, the panoramic moonroof and all-wheel drive, and you'll have a downright rich-feeling crossover," Cars.com warns, "but it will set you back more than $28,000." Very happy with features, performance, and reliability. Nice small SUV for daily use and working utility. Very happy with it.